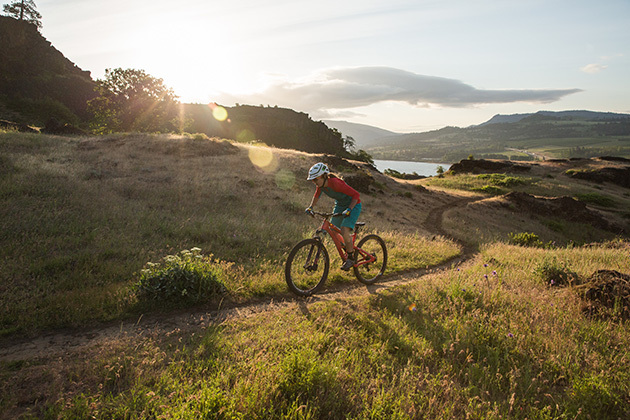 Female influences have been a constant throughout Yeti Cycles’ heritage–over the years it’s sponsored some of the fastest women in the sport, the likes of Juli Furtado, Marla Streb, Tara Llanes, Jill Kintner and Rosara Joseph–but until now it hasn’t marketed a bike specifically for that demographic. 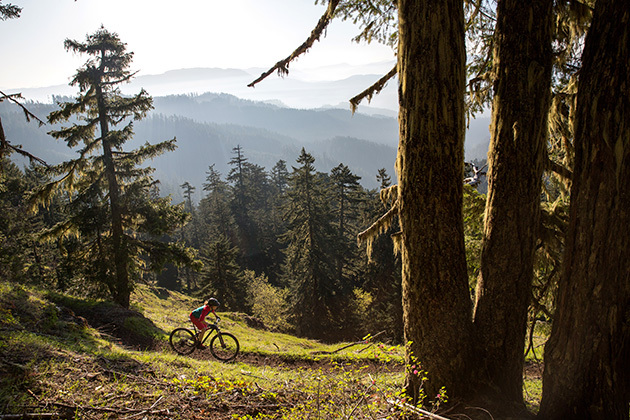 That changes today with the official release of the Yeti Beti line, which includes a uniquely outfitted version of Yeti’s popular SB5C trail bike and ASRC XC race bike. Following the trend set in recent years by Juliana Bicycles (the women’s-specific brand of Santa Cruz Bicycles), the frames themselves aren’t designed with different geometry and they don’t require different, costly molds. 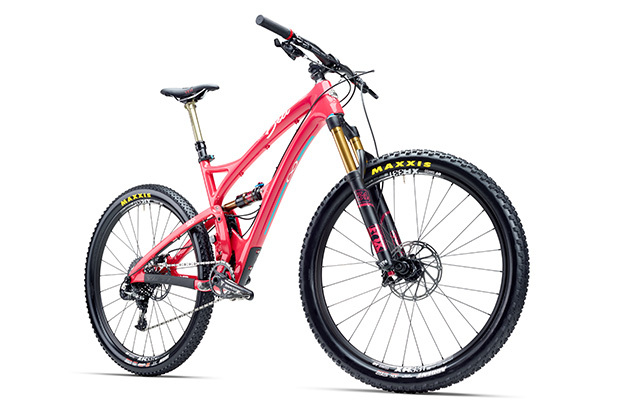 Instead, Yeti has opted to hang existing frames with carefully chosen parts that make the bikes more comfortable for lighter, smaller riders, like smaller diameter grips, shorter cranks, narrower bars, a women’s-specific saddle. The frame is coated with a different paint color, to boot. 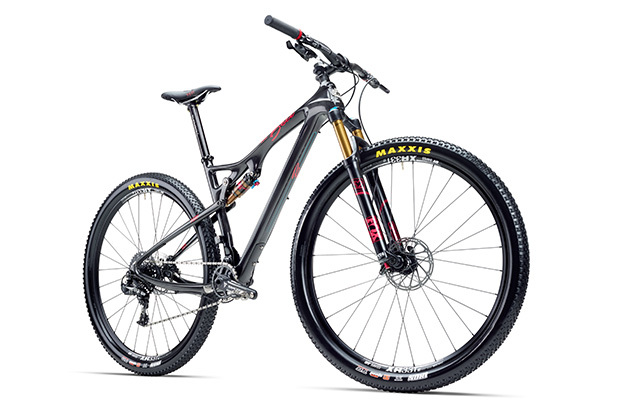 The Yeti Beti name is a nod to the regional race team that Yeti has sponsored for the better part of a decade. The women on the team, who are all legit Colorado shredders, also provided input on the components selected for the women’s bikes. In the case of both models, the bikes are outfitted with 170-millimeter cranks instead of 175 on the XS, small and medium sizes, for ease of pedaling and to provide additional clearance in technical sections. Yeti also spec’d a very reasonable 720-millimeter-wide Easton EC90 handlebar with a 55-mil Easton Haven stem on the SB5C and the same bar with a 70-mil stem on the ASR and used a custom WTB Deva saddle on each bike. They also chose a lighter wheelset–the DT Swiss XR 331 rim with DT 350 hub, compared with the DT Swiss DT 350 with XM 401 rim rim on the unisex version of the SB5 with the same build and Stan’s Crest on the ASR. Yeti is offering both of the bikes in a one-by SRAM XO1 build with a 30-tooth front chainring Race Face Turbine front chainring. Yeti made a minor, but important decision to swap the 32-tooth front chainring that comes on the original bikes. Switching to a one-by drivetrain can seem intimidating to some and starting with a smaller chainring up front is a good move–better to make the climbs easier and risk spinning out on the odd descent than feel undergunned on ascents. Personally, I’ve found that the 30-tooth chainring up front combined with SRAM’s 10-42 rear cassette offers ample gear range in nearly all riding conditions. The geometry of both bikes is identical to the existing versions, and both follow Yeti’s time-honored ‘long and low’ philosophy with a 23.6-inch toptube on size medium and 13.4-inch bottom bracket height on the SB5 and a 23.7-inch toptube and 13-inch BB height on the ASR. The 27.5-wheeled SB5 incorporates a trail bike-appropriate 67-degree headtube angle, while the ASR falls closer to the XC category with its 69.1-degree headtube angle. Both come in five frames sizes, from XS to XL, which means a women as short as 4-foot 11-inches should be able to find a comfortable fit. The SB5c uses the same Switch Infinity rear suspension platform that Yeti debuted on the original SB5C last year. The ‘translating pivot,’ which is the Fox bit tucked into the frame below the linkage, is designed to increase pedaling efficiency so you can climb with the shock in Trail or Descend mode without sacrificing performance, and also descend with reckless abandon. Yeti debuted the Beti bikes to a group of journalists last week at its headquarters in Golden, Colorado, and we rode the SB5 on the Apex trail out the backdoor of the office. In just one ride, I could already start to feel the genius of the Switch Infinity system. I climbed almost the entire 3-mile rocky ascent with the shock wide open and felt superb rear-wheel traction on the ledgy, technical sections. It wasn’t all pretty–there were two sections I didn’t clean, but I’m blaming that on the Colorado altitude, of course. I was more impressed with how much of the trail I did manage to get through. There are several, super-steep parts of trail with difficult moves required and I was surprised at the number times I looked ahead, dreading the chunky rock sections that would surely stop me mid-pedal, bash my cranks and bruise my ego, but instead found myself powering up and over the rocks. With the plush rear suspension and a new Fox 34 fork up front, descending through the fast rock gardens littered with small drops was ridiculously fun. After only one ride, my main takeaway was that the SB5C’s travel feels much deeper than a 5-inch-travel bike–the versatility of this bike is definitely its best asset. That and the awesome coral paint job. Yeti modeled the frame color after its wildly successful Norrie women’s shorts it started selling last year. The shorts were so successful that it was clear designers had found a color that resonated with women and thus carried the color forward with the new bike. The SB5C also comes with the excellent Thomson Covert dropper post and Shimano XT brakes. It’s available in the XO1 build for $6,900–the same price as the unisex version. The guys at Yeti have a really great sense of humor. I found this out when they told us that we’d be ‘testing’ the ASRC during the XC race at the Beti Bike Bash, a women’s only event that the Betis organize and which draws some 400 racers each year. This seemed hilarious, given the fact that I was a flatlander in the mountains, where simply walking up a flight of stairs nearly required supplemental oxygen. And I can count the number of XC racers I’ve ever entered on one hand. But what’s the worst that could happen, right? That’s what I kept mumbling as I lined up in my age category on race morning, hunkering in the back row, scolding myself for staying out too late the night before and eating hotel ‘cheesy eggs’ and bacon for breakfast an hour before. By the time the started counted us down, my goal for the day had diminished to just finishing the race without having to stop to dry heave. Then something happened. The adrenaline kicked in and I found myself passing people and feeling fast and fit on the 4-inch-travel, carbon-fiber 29er race machine (I rode a size medium, which comes with 29-inch wheels–the extra-small and small are both outfitted with more frame size-appropriate 27.5-inch wheels). The 6-mile race lap wasn’t technical, but there were several gradual climbs that the bigger wheels charged right up, and a few switchback sections that I was able to easily whip around. The 17.5-inch chainstays are particularly snappy on paper, but the geometry felt balanced and stable, even while descending without a dropper post. Gasp! I don’t know whether my ultimate sixth place finish can be attributed to the bike, but based on my pathetic pre-race preparation, I’ve got to think it played a pretty big role. The ASRc also comes in solely a SRAM XO1 build, with a Fox Float 32 front fork and custom-tuned rear shock and Shimano XT brakes. It runs $5,800. Both bikes are available in stores this week. Look for a full review of the Beti SB5C in an upcoming issue of Bike magazine.